Join us for an intimate evening hosted by members of the Trione family! 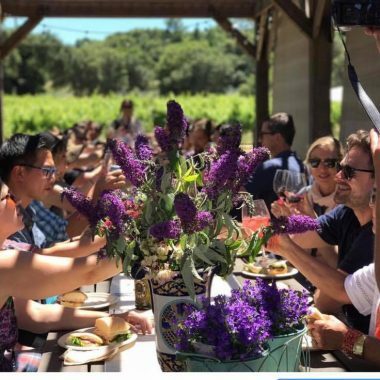 We will begin in the tasting room with a wine reception and then head to the communal dining table where you will be treated like a king or queen and pampered with incredible food and wine. Indulge in a delicious, market inspired, garden fresh, dinner prepared by Peloton Culinary. Sip on Scot’s award winning wines; sample some new favorites and enjoy some library wines that were cellared and held back just for these dinners! This is an upscale farm-to-table dinner with a plated first course, family-style main courses, and a plated dessert – all paired with Trione wines made from our estate vineyards. After the dinner, we will end in the tasting room with a special wine to finish the evening off right. Dinners begin at 6PM and end 9PM. Come, bring your friends, enjoy great wine, food, and good company! Seating is limited to 35 people. $80 for wine club members and $100 for general public.Due to the nature of our events, we cannot accommodate special dietary requests except for vegetarian.